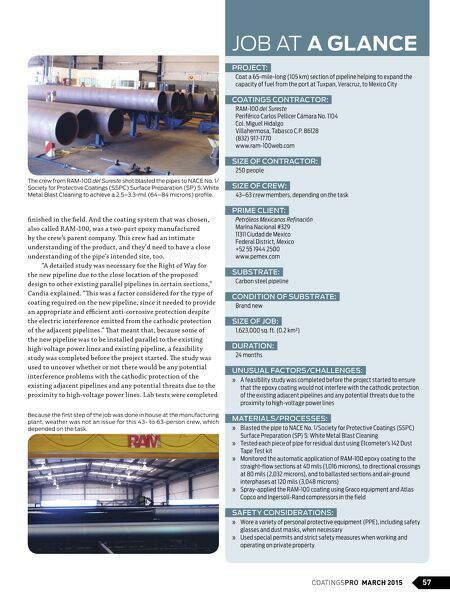 56 MARCH 2015 COATINGSPROMAG.COM the specifcation for line pipe for petroleum and natural gas indus- tries and yielded a minimum strength of 52,000 psi (359 MPa). Te crew had an average of 43 people working on this project, with an additional 20 members added, depending on the task. Tat crew size, combined with an in-plant coating operation and an on-site coating application, helped to ensure that the project was completed within 24 months. It was a demanding project for sure. Importance of Location Te project started at the company's site where pipe was put through the automated coating plant before coating could be The pipe was made out of brand new carbon steel. It measured 18 inches (46 cm) by outside diameter and was considered "API 5L X52," which is an American Petroleum Institute (API) designation. Each of the 8,600 pieces of 40-foot-long (12 m) pipe, were specified for petroleum and natural gas industries. These pipes were also able to yield a minimum strength of 52,000 psi (359 MPa). 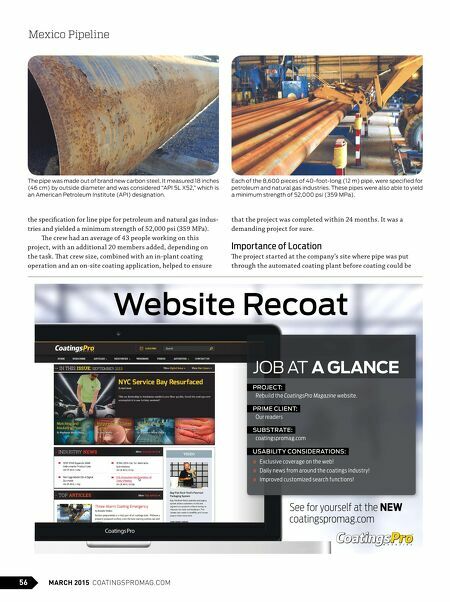 Mexico Pipeline Website Recoat See for yourself at the NEW coatingspromag.com JOB AT A GLANCE PROJECT: Rebuild the CoatingsPro Magazine website. PRIME CLIENT: Our readers SUBSTRATE: coatingspromag.com USABILITY CONSIDERATIONS: » Exclusive coverage on the web! » Daily news from around the coatings industr y! » Improved customized search functions!